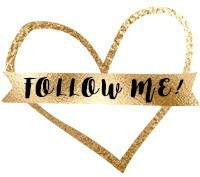 You are here: Home / Makeup / So Many New Cruelty Free Products from Physicians Formula! 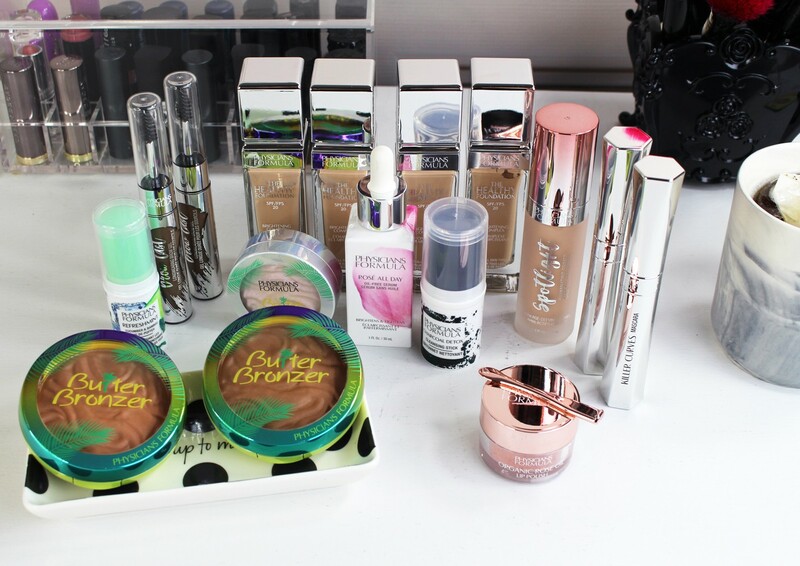 So Many New Cruelty Free Products from Physicians Formula! Well hellooooo Physicians Formula! You are really stepping up your game lately! There are a ton of new Physicians Formula cruelty free makeup and skincare (yes – skincare!) products that are launching this month. The packaging and formulas feel super high end (I’m definitely getting department store vibes for some of these). There are a lot of new products, and I got a little nuts with the photos, but hopefully this will help you decide which ones to buy! All of them are cruelty free and Physicians Formula is owned by Markwins (cruelty free!). I have noted which products are vegan below each. Let’s take a closer look at each product, but first here’s the finished makeup look. This is a SUPER easy five minute makeup look. In the pics above, I’m wearing the new Physicians Formula Illuminating Primer, The Healthy Foundation, both of the new Butter Bronzer shades (Deep as contour and Sunkissed as bronzer and eyeshadow), the new Butter Highlighter in Iridescence, the Brow Last brow gel in Medium Brown, Killer Curves mascara on lower lashes, and The Healthy Lip liquid lipstick in Coral Minerals. Let’s start with the foundation. I am so impressed! 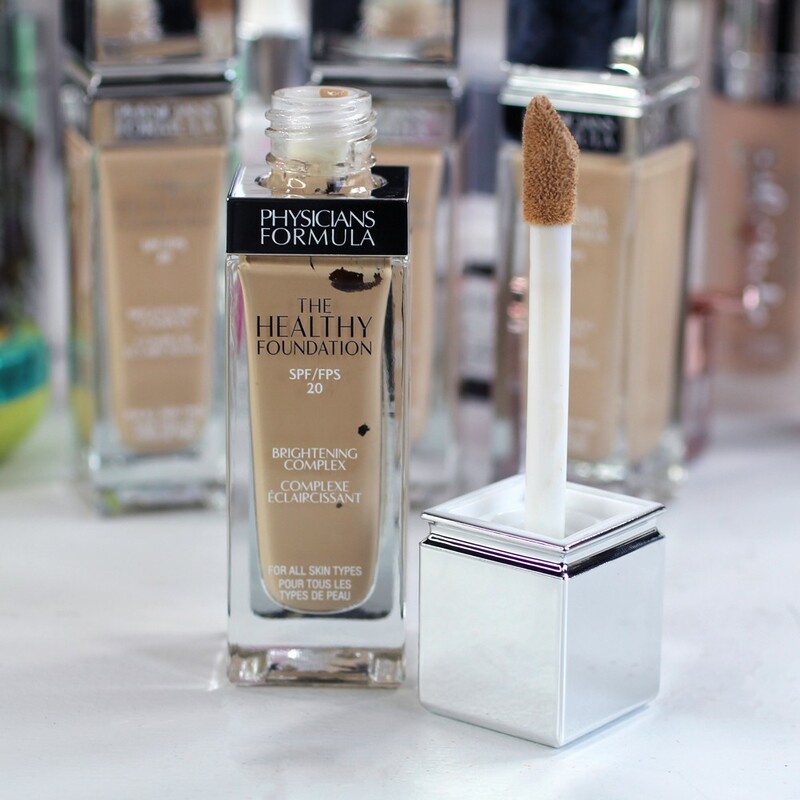 The new Physicians Formula foundation is called The Healthy Foundation because it’s packed with skincare ingredients that brighten, hydrate and protect your skin. The formula includes a brightening complex (Chinese Wu-Zhu-Yu extract), hyaluronic acid, Vitamin A, C & E antioxidant blend, and SPF 20. I LOVE that the formula includes SPF 20 because it gives me back up when I forget to apply my sunscreen (which is more often that I care to admit!). It’s also safe for sensitive skin. 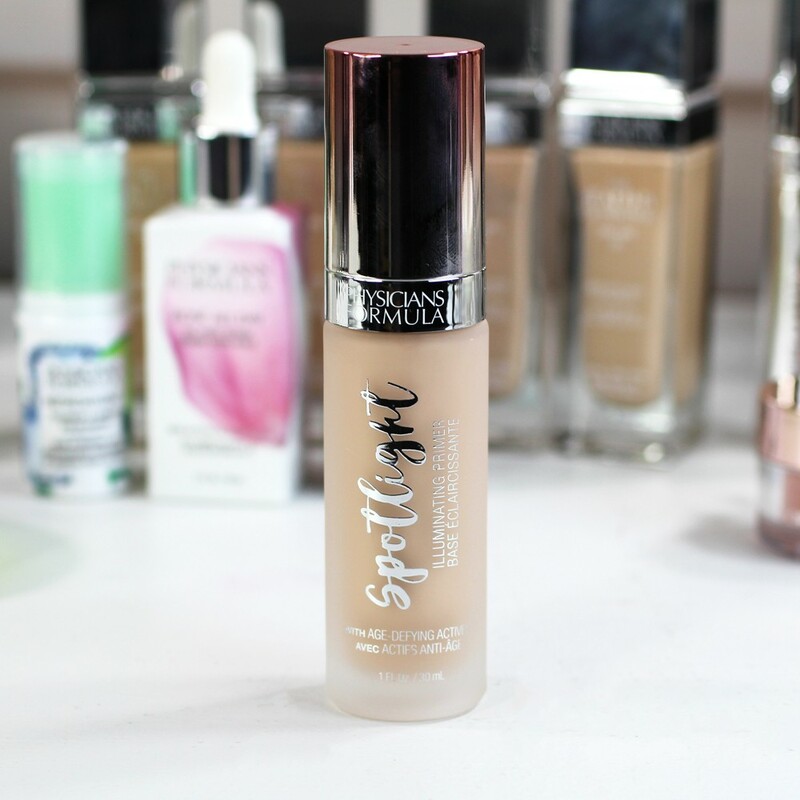 You’ll get medium to full coverage from this foundation, and you can layer it if you need a little more coverage in certain spots. It doesn’t feel heavy at all on my skin, which is important to me. The packaging itself is gorgeous (actual glass bottles with large doe foot applicators). Between the formula and the packaging, this foundation feels SUPER high end. If you took the label off, I would assume the foundation would be in the $60 range, but it’s actually only $14.95! This is the first full shade range for Physicians Formula, which means the shades go much farther than pale to medium. There are 16 shades from Light Cool 1 all the way to Deep Neutral 4. 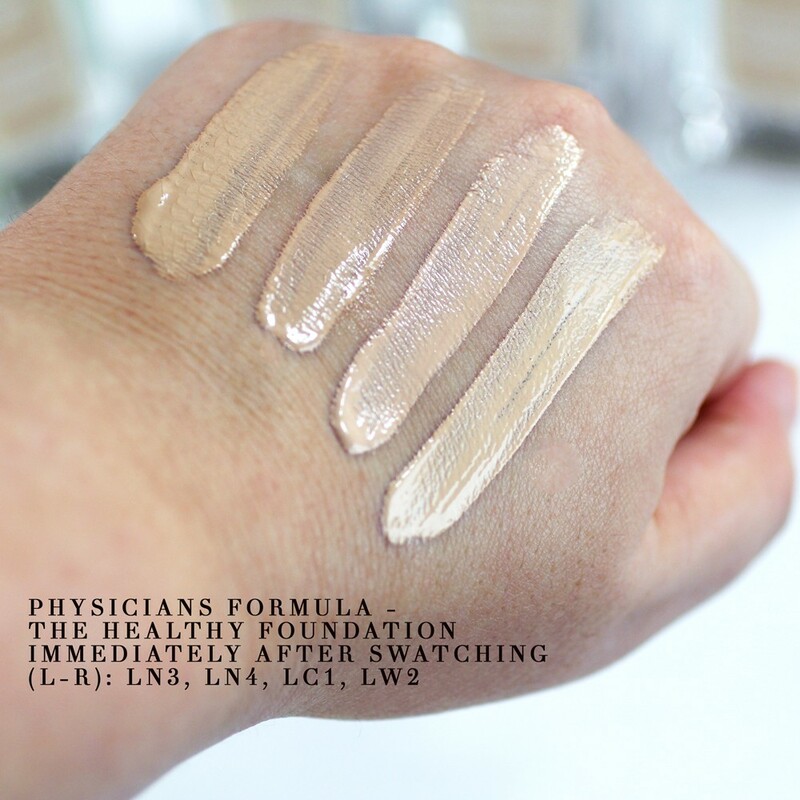 While this is not the most extensive shade range out there, it’s a huge step for Physicians Formula (and drugstore makeup in general), and I am happy to see things a’changin’! 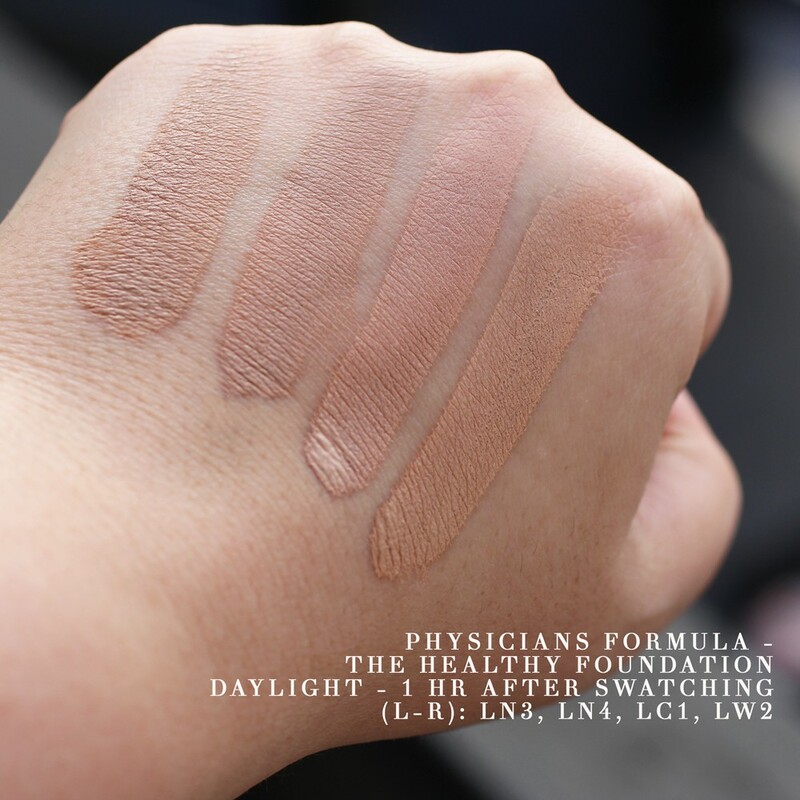 I was sent the four “light” shades to test out: Light Neutral 3, Light Neutral 4, Light Cool 1 and Light Warm 2. I swatched these on my hand and then took photos immediately after (indoors under LED daylight bulbs), and then one hour later (indoors and outdoors). I wanted you to be able to see the colors after they had a chance to oxidize, as well as under different lighting conditions. 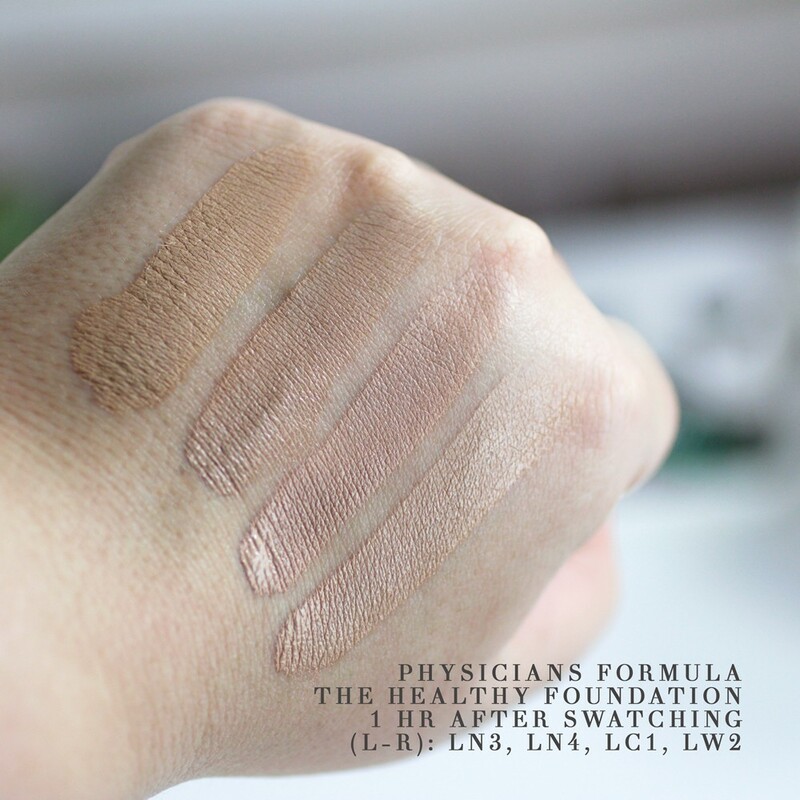 The formula is very forgiving, and I found that LN3 (the first one in the pics – with the more yellow undertones) melted into my skin just as easily as the more expensive brands that I wear. The Healthy Foundation is vegan. 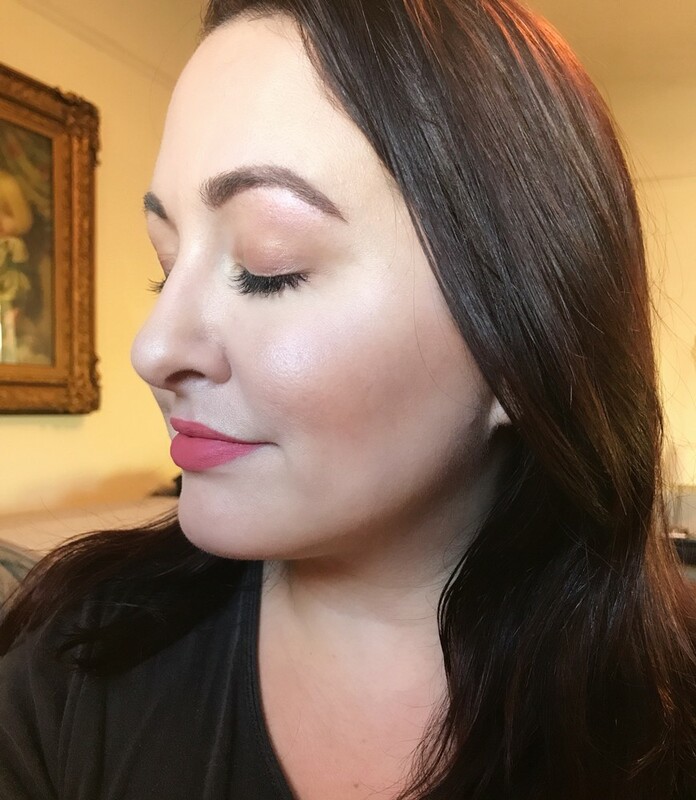 As an oily skinned gal with large pores, I usually run away from anything that promises to “illuminate” my skin, but I was pleasantly surprised at how much I love the new Physicians Formula Spotlight Illuminating Primer. As you can see from the photo, it’s got a lot of shine to it. When I wear it under my foundation, it actually blurs out imperfections and gives me that dewy look without making my pores look like craters. 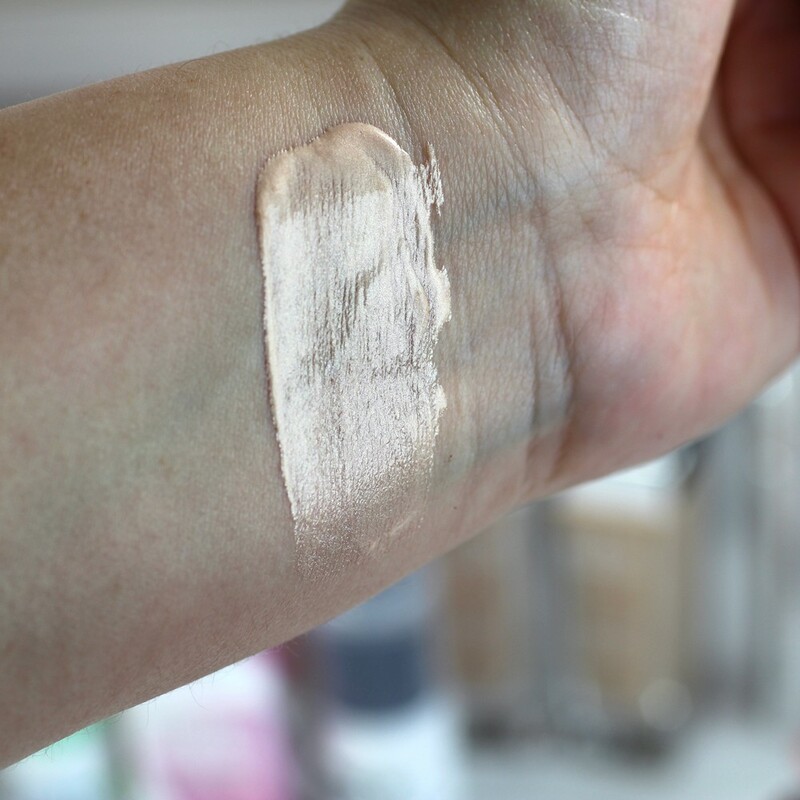 If you want more shimmer, you can actually apply it on top of your foundation. Like the new foundation, this primer also has a ton of skincare-like ingredients to hydrate and protect your skin. 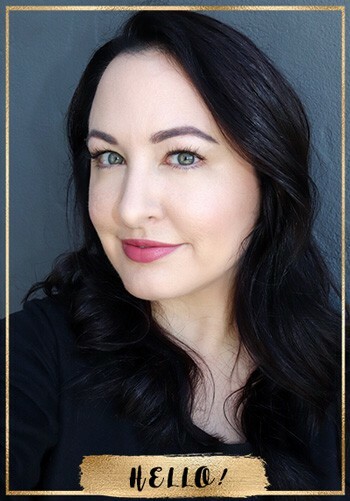 The formula is made with China Wood, rapeseed oil, Vitamin A and Vitamin E.
The Spotlight Illuminating Primer does contain carmine, so it’s not vegan. 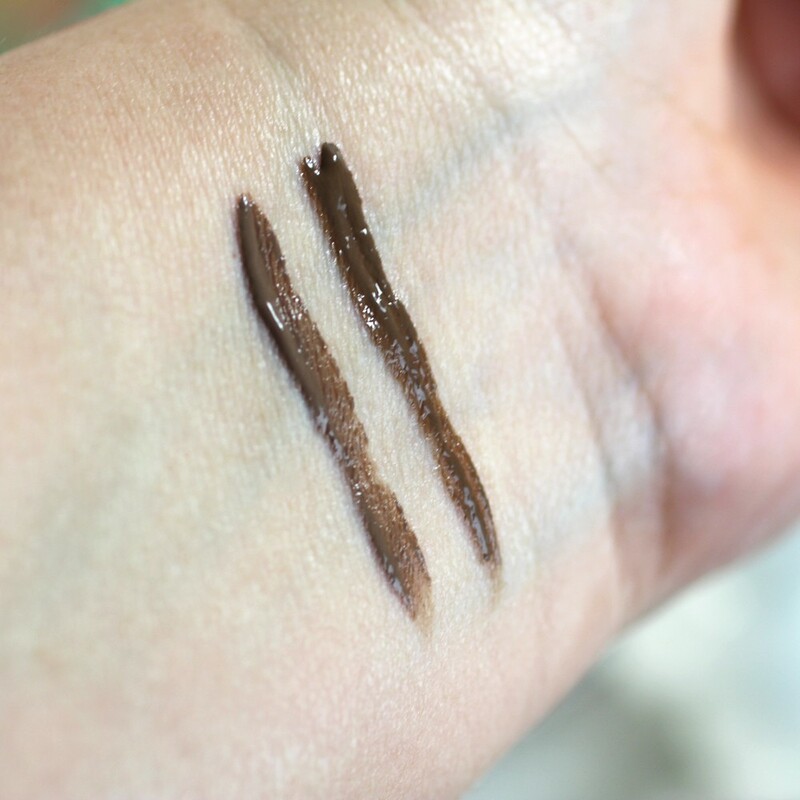 When I saw the new Brow Last Longwearing Brow Gel, I thought it was the kind of brow color that you comb in (a la Boy Brow), but it’s actually more than that. 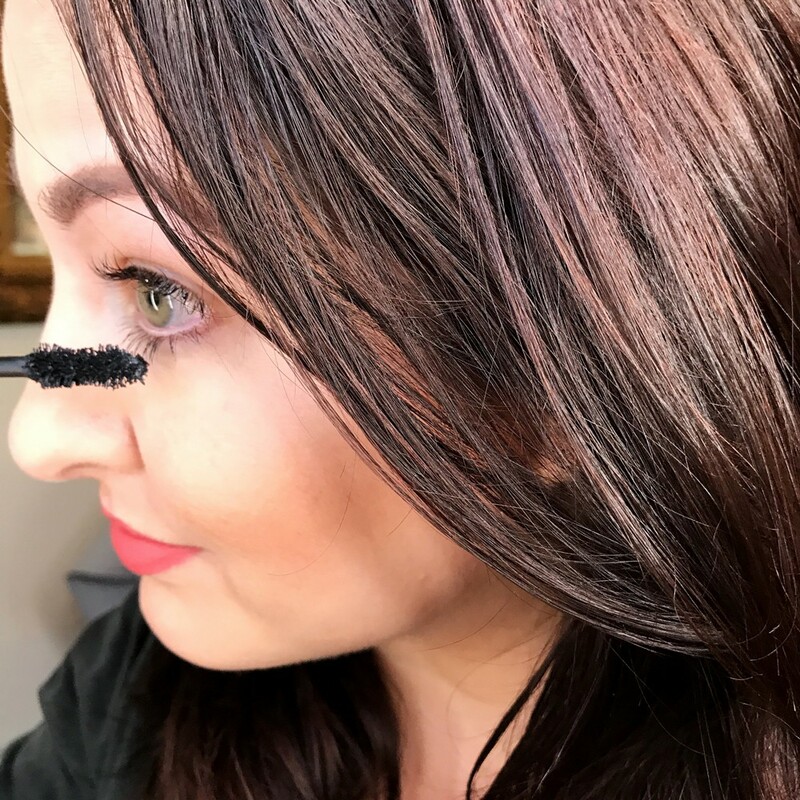 It’s a brow color that is slightly more liquid than your average gel, and it comes with an angled eyebrow brush to apply with maximum precision, and a spoolie to comb through. The formula contains fibers to add depth and a natural look to your brows. I tried Medium Brown and Dark Brown (shown above) and I was very happy with the Medium. It’s a nice taupe-ish color – not too warm and not too cool. It’s pretty bold, so I’d recommend choosing the lighter of two shades if you’re undecided on which one to get. It’s long-wearing and doesn’t budge once it dries. I was really impressed with this one, and I think it’s a worthy alternative to many of the more expensive brow products out there. 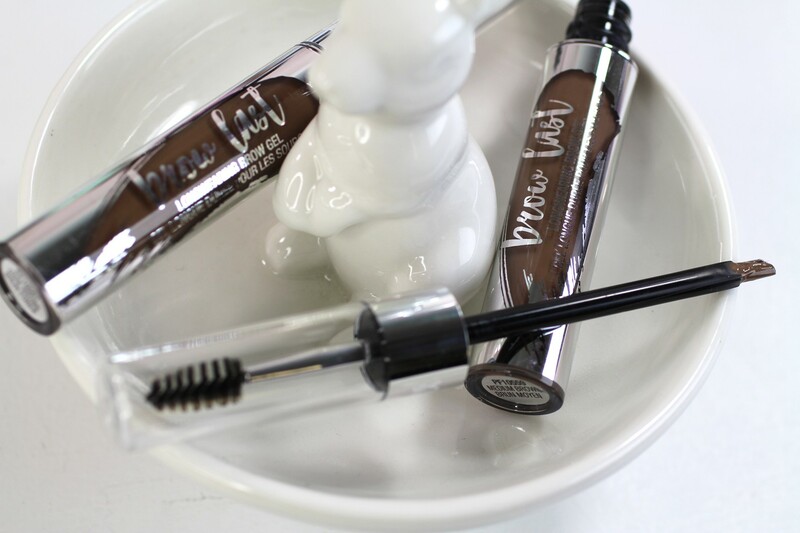 The Brow Last Longwearing Brow Gel is vegan. The new Physicians Formula Killer Curves mascara has an hourglass shaped wand (definitely inspired by another way more expensive mascara!) and a non-smudging formula. It has conditioning and strengthening ingredients (peptides, amino acids and provitamin B5) plus lash-lifting polymers to get extra curl. I have lash extensions, so I don’t use mascara on my top lashes. I used it on my bottom lashes, and I really liked it. It lengthened without adding clumps, and it stayed on all day without smudging (quite a feat for the lower lashes). It comes in two shades: black and black/brown. 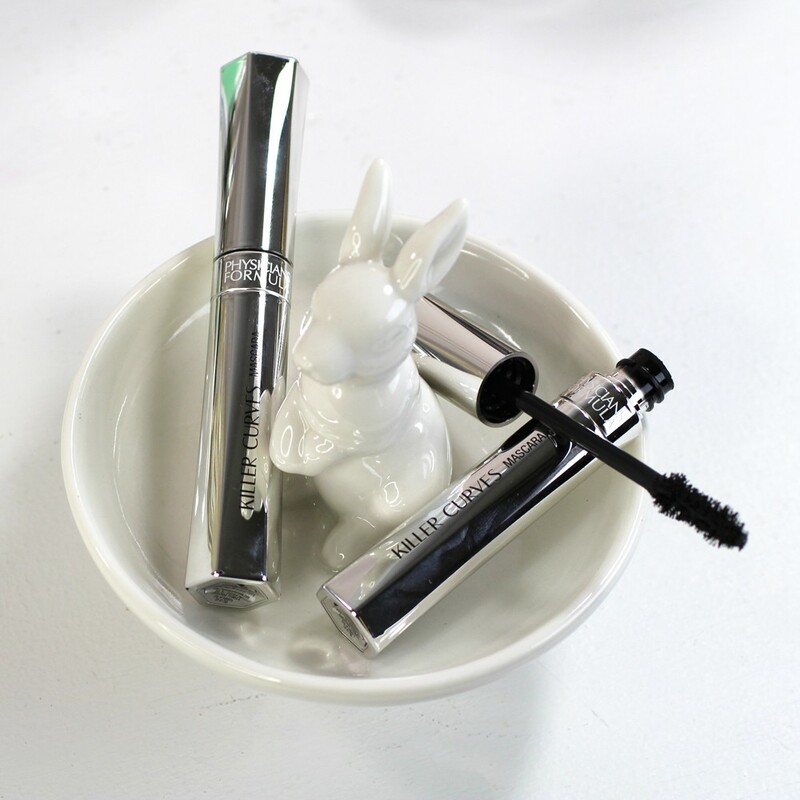 The Killer Curves mascara is vegan. The ingredients list collagen, but I confirmed that it’s a plant-derived collagen alternative from the red acacia tree. There’s a brand new shade of Butter Highlighter called Iridescence and it’s my FAVORITE so far! It’s a holographic pink highlighter and true to the name, it’s super buttery. It’s so buttery that it’s almost a cream blush (they actually call it a cream to powder blush, so I guess I’m right!). You can apply with fingertips or a brush – whichever works best for you. The formula is ultra-hydrating with exotic Amazonian ingredients (murumuru butter, cupuacu butter and tucuma butter) and anti-aging peptides. Mica and silica give it a MAJOR light-diffusing, unicorn pink holo shimmer! 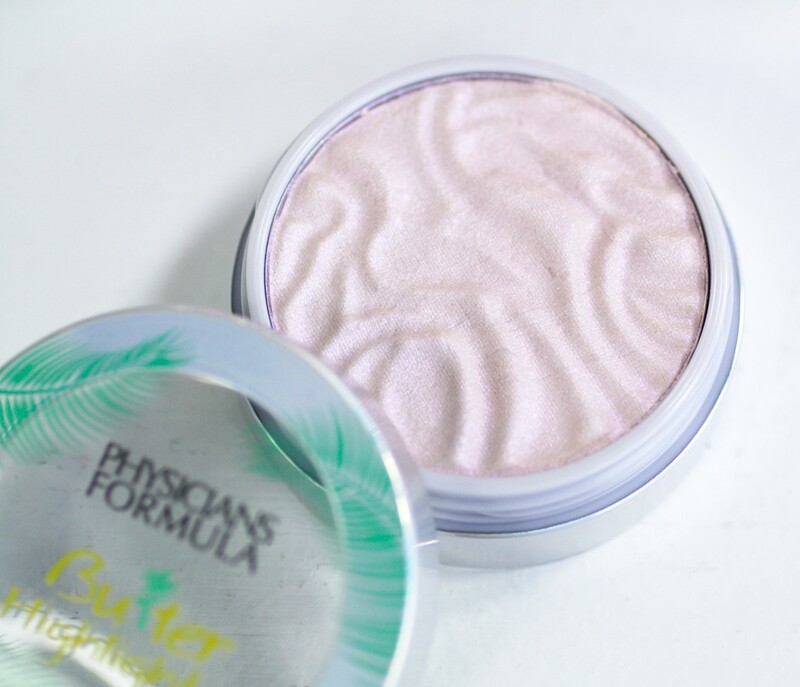 It’s hard to capture how amazing this highlighter is in a photo, but trust me – it’s one you definitely need in your collection. Oh and it’s got a really nice pina colada beachy scent! 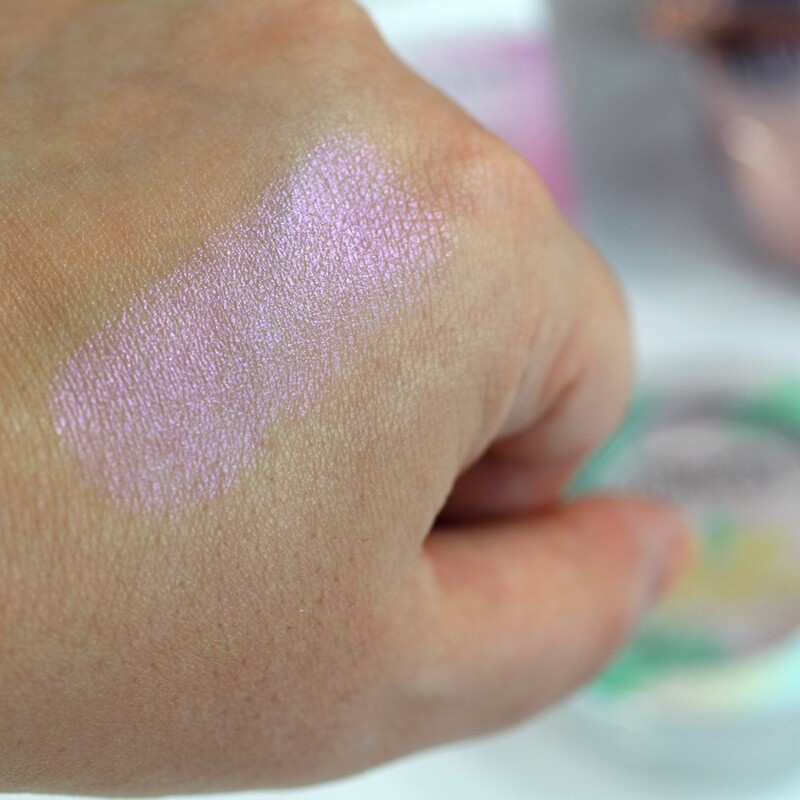 The Physicians Formula Butter Highlighter in Iridescence is vegan. All shades are vegan except for Pink. There are two new shades in the cult favorite Butter Bronzer family for medium-skinned gals (and guys): Sunkissed and Deep. Just like the other Butter Bronzers, these are creamy and soft (still powdery – not quite in cream bronzer territory though). They have that beachy scent that you all know and love. I’m very pale and I can use these as contour shades and as bronzers (with a light hand) so I personally think they’ll be great for medium skin tones (but probably not darker skin tones). All Butter Bronzer shades are vegan. 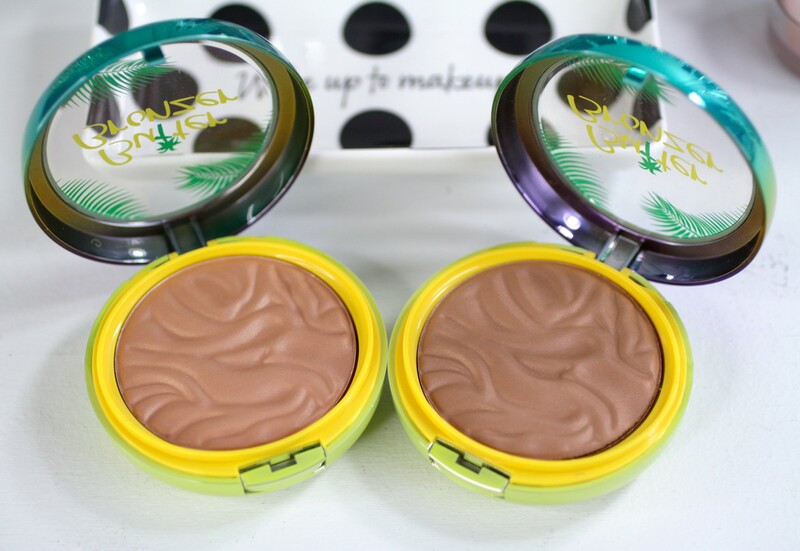 Physicians Formula is jumping into the skincare game! 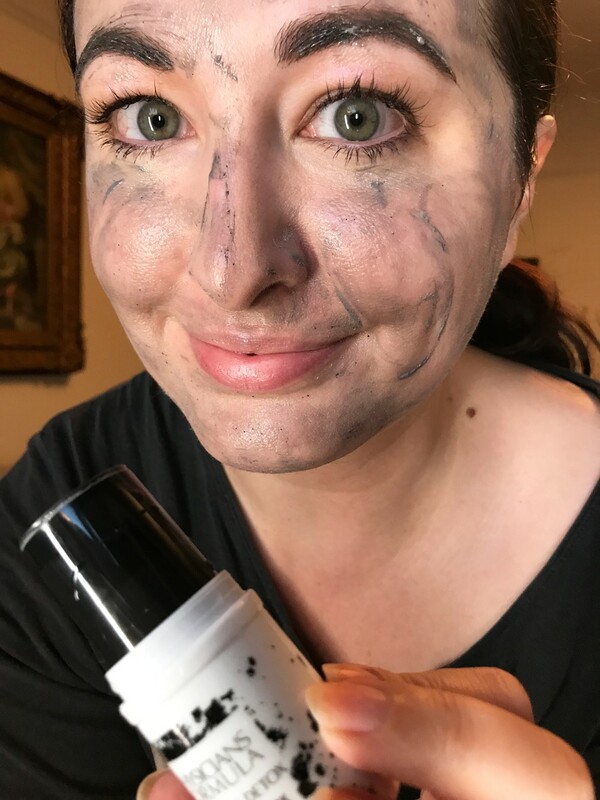 They have had a few argan oils and oil blends, and a makeup remover, but this is the first time I’ve seen them wander so far into the skincare world. 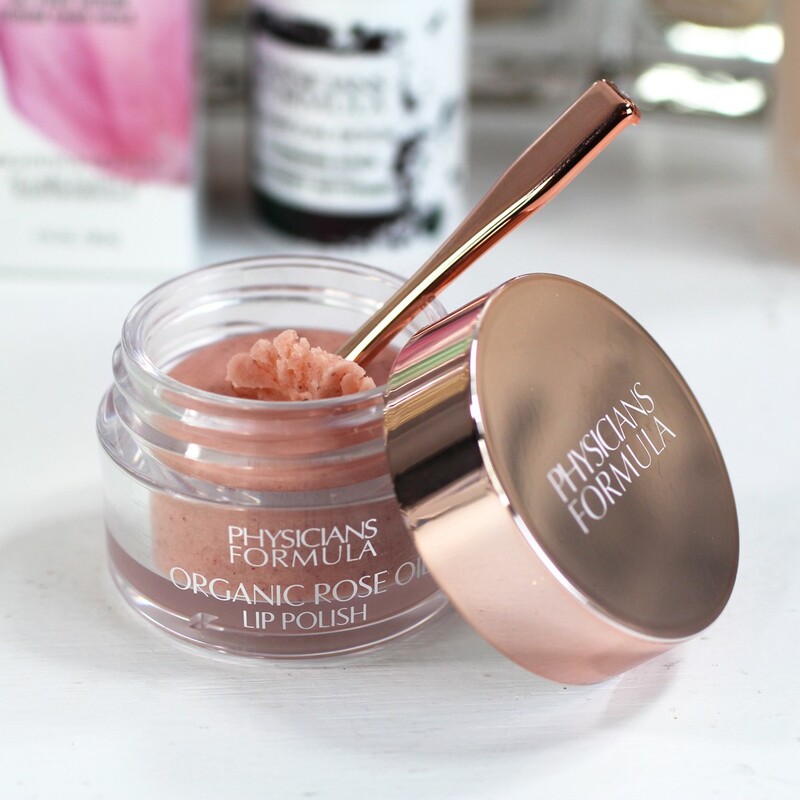 The Organic Rose Oil Lip Polish looks like the expensive, high-end products you’d see in a department store, and the formula lives up to its packaging! You guys know I love all things rose-scented, and this lip polish smells SO good. This product will help keep all that gross, dead skin off your lips during the winter (especially if you’re a liquid lipstick fanatic). It’s made with organic rose oil, organic raw sugar, organic coconut oil, and organic shea butter. If you’re looking for natural, green beauty options, this is one to check out. The Organic Rose Oil Lip Polish contains beeswax, so it’s cruelty free, but not vegan. 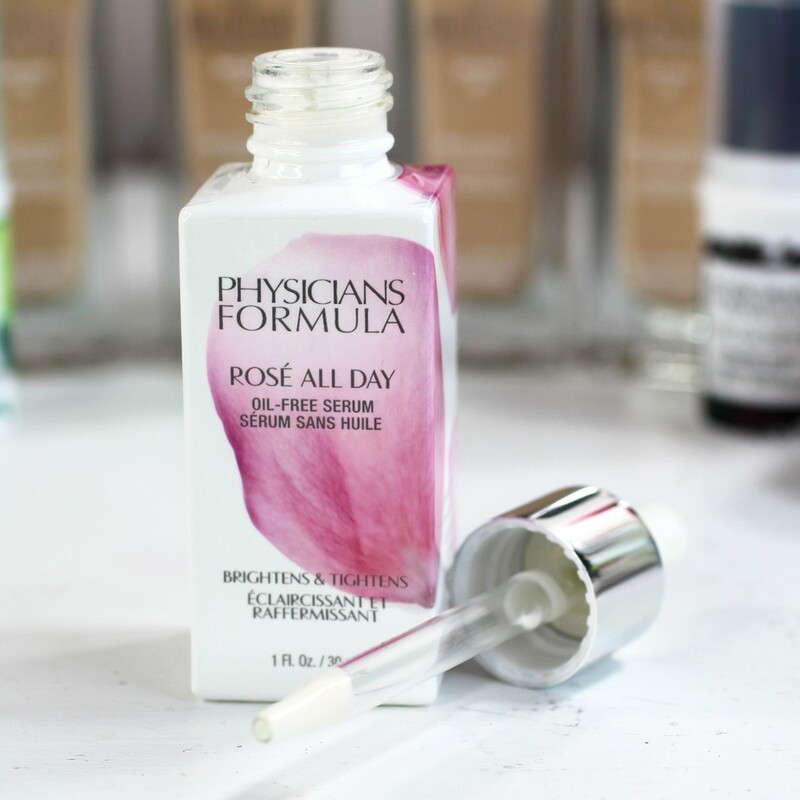 The Physicians Formula Rosé All Day Oil-Free Serum is part skincare and part primer. 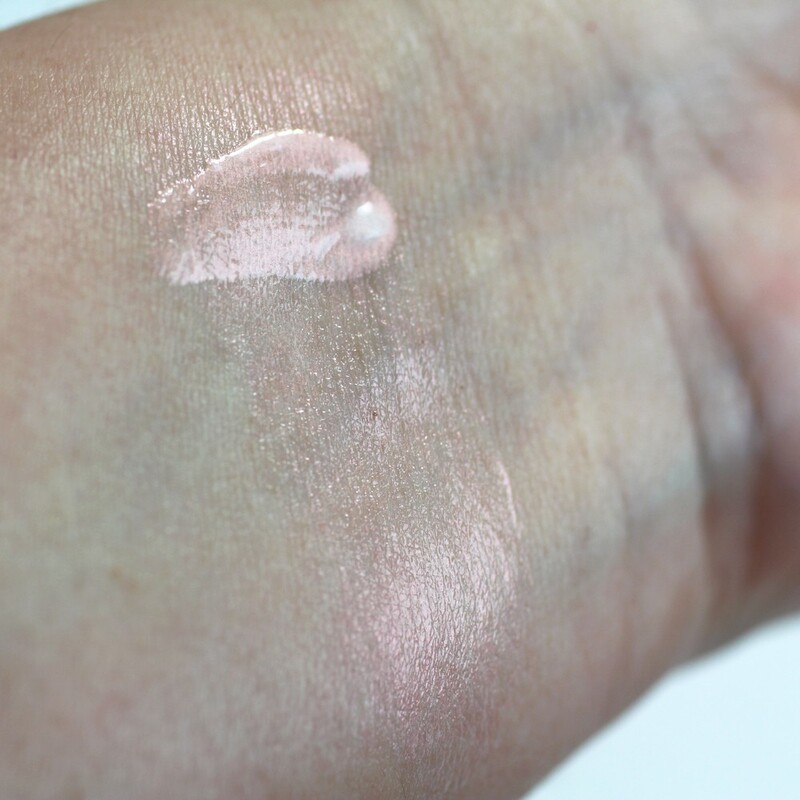 It has a MAJOR pearly, luminescent glow (almost like a liquid pink highlighter) that looks gorgeous under makeup. It’s oil-free (which for my acneic skin is a huge plus), and it’s packed with antioxidants and vitamins to help brighten and heal your skin. Rosewater balances skin tone and reduces redness. Goji berry is full of antioxidants. Vitamin E moisturizes and conditions while protecting skin. Kakadu Plum extract is full of Vitamin C to brighten and even out skin tone. Peptides tighten skin and help with premature aging. I swatched it and then sheered it out a bit in the pic above so you can see how it looks once you rub it in. The Rosé All Day Oil-Free Serum is vegan. 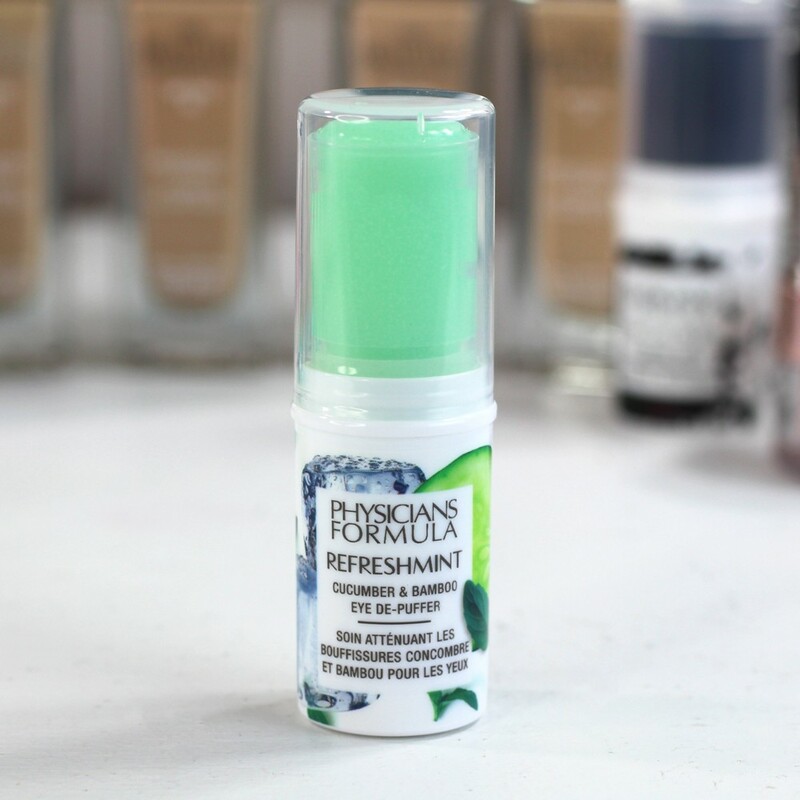 The Physicians Formula Refreshmint Cucumber and Bamboo Eye De-Puffer is following the millennial-favorite trend of putting things in an easy to use stick form. I personally prefer my skincare to be in a tube or pump, but hey – there’s definitely a market for this type of packaging with the younger crew (and possibly with men as well). I will say the stick makes it travel friendly – you can keep it in your bag, and I think it’s small enough for TSA to keep their hands off! The formula contains peppermint, cucumber, aloe vera, and bamboo shoot. It feels cooling on contact which is really nice for puffy (or hungover) eyes. Another stick! What’s up with you millennials and your sticks? LOL! 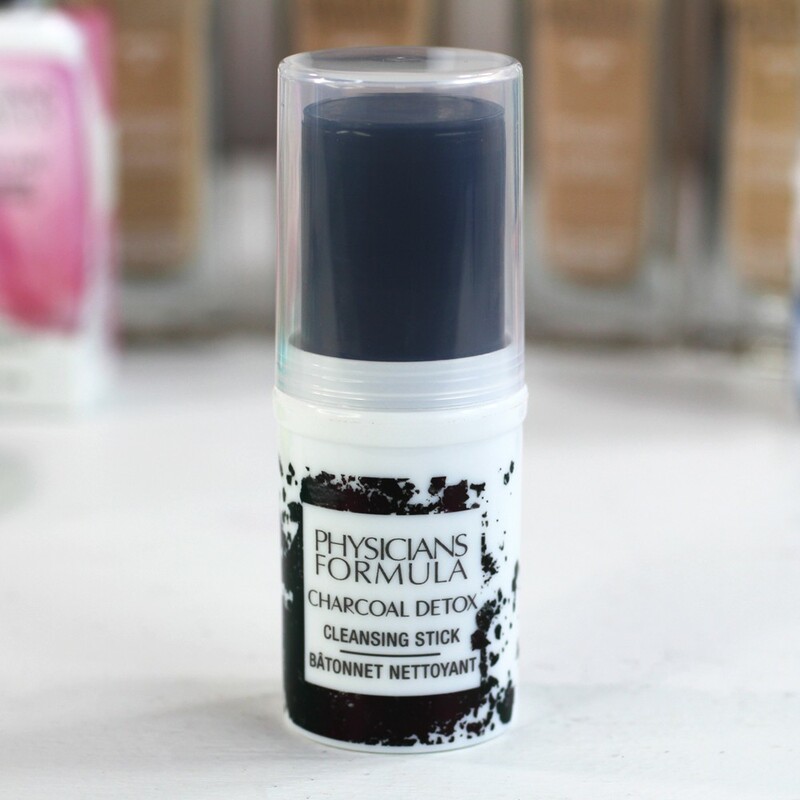 The Physicians Formula Charcoal Detox Cleansing Stick cleanses and exfoliates in one step. The formula has bamboo charcoal, artichoke leaf (antioxidants), and exfoliating minerals. I honestly thought the formula was pretty generic until I saw that it contains glycolic acid, my favorite ingredient for deep exfoliation, brightening and anti-aging. This cleanser is safe for sensitive skin and all skin types (it’s balanced – not drying or oily). This one is also travel friendly (0.55 oz). 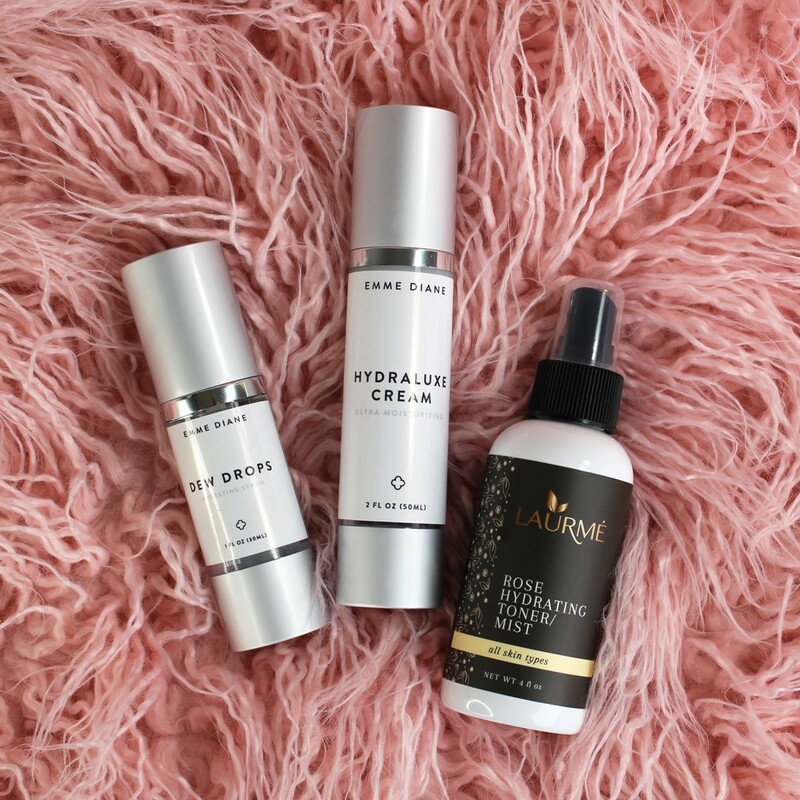 The Charcoal Detox Cleansing Stick is vegan. Wow, look at all those pretties! I am in love with the Butter Highlighter. I’ve got the pink shade, and it’s such a delight to use. 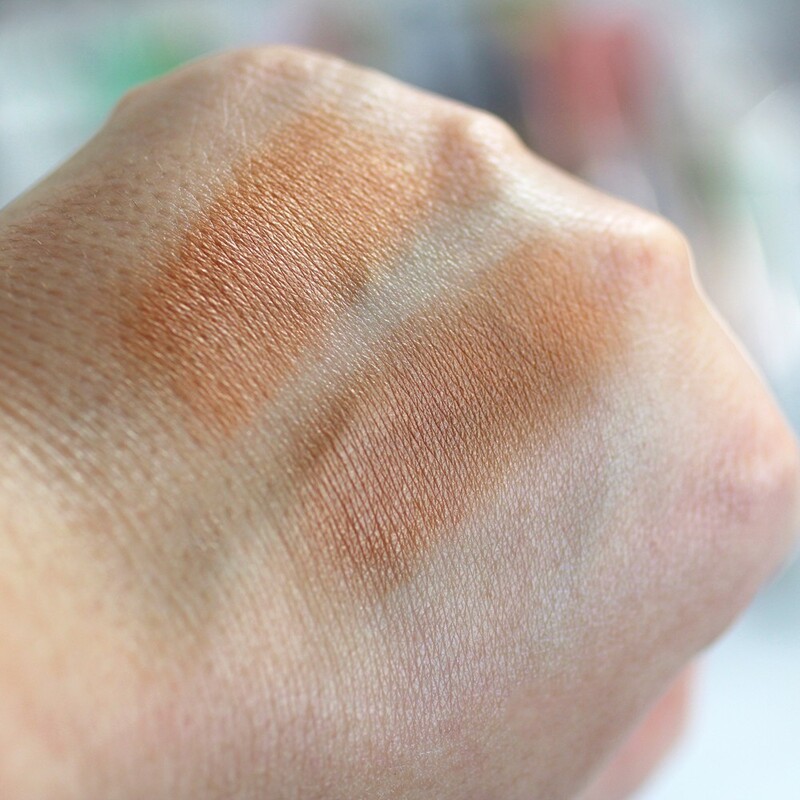 Looking at the swatches on your hand, I think I could find a shade among the lighter shades. Very appealing! It amazes me the extent to which drugstore brands have tightened the gap that once existed between their products and those found in department stores. These look gorgeous and luxurious! I wish the foundation came in a shade to match me! Hurry up Australia and get with it, we need these new products!!!!! That’s so many interesting products! 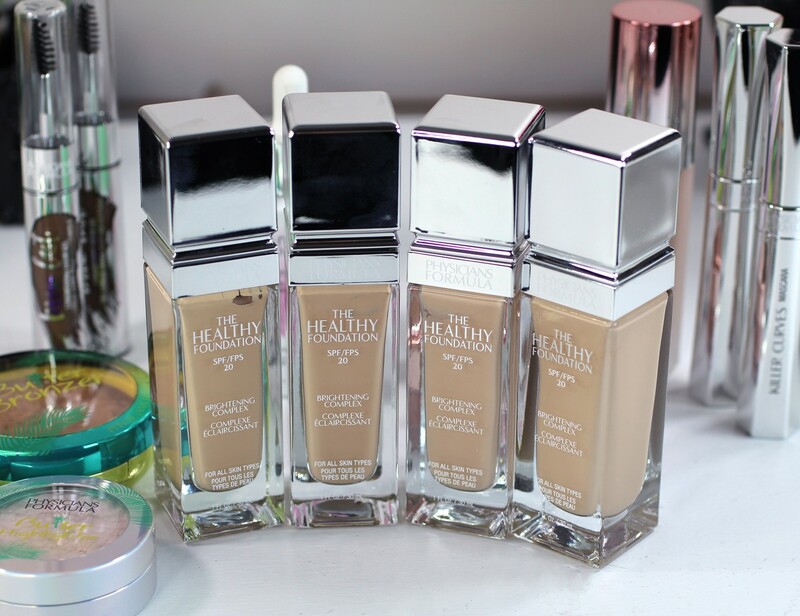 Your skin looks incredibly smooth with the primer and foundation. I must try everything!! You look fab!! What an amazing array of products. I wish I could wear that highlighter but the fragrance bothers me. My favorite PF product is their liquid eyeliner in brown. I wear it all the time. Rosé all day 😂 Love that! I only JUST got the Light Butter Bronzer and a Butter Blush via iHerb because we don’t them here in Aus yet. Sometimes it takes ages for them to release them here and other times we don’t get them at all. I pray we get these items, there are lots I want to try! I have tried Physicians Formula Killer Curves mascara and loved it alot,..
Oh wow that highlighter is insanely gorgeous! Total must-have! This makes me SO happy as a very dark skinned woman (the Deep N3 or N4 is likely what I’ll wear.) I finally have an alternative to Becca’s foundation for when I don’t have $40 to shell out. I love PF and this review makes me want to make a major haul! If I can find reasonably priced, cruelty free products that work, sign me up!! Can’t wait to try all of these. 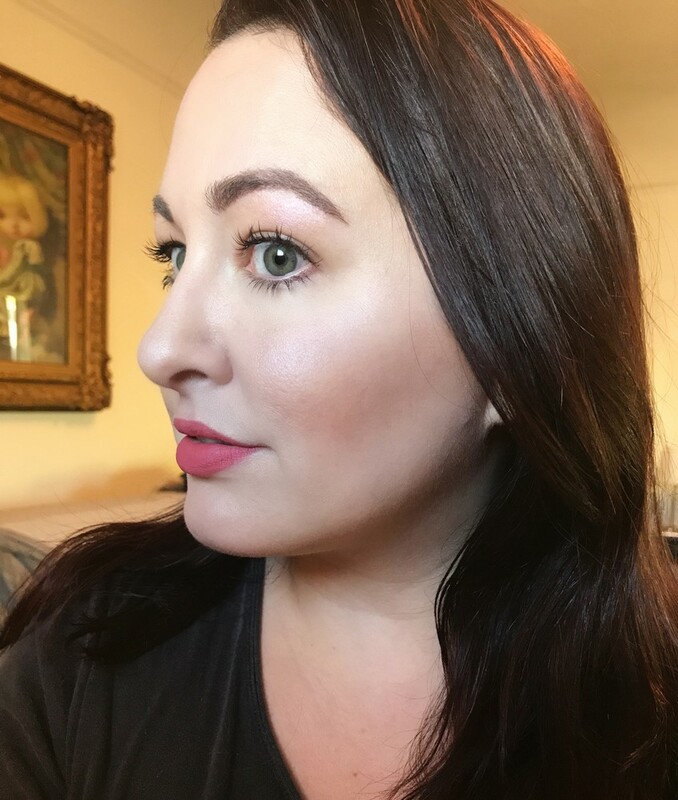 I wear the too faced born this way foundation in the color vanilla if you are familiar with it and could recommend a color match I’d appreciate it! Hi Melissa! There are so many color options – I think you should buy one from a drugstore that accepts returns (I think most of them do these days) and return it if it doesn’t match. I can’t remember the last time I commented on someone’s blog post. Probably yearssss ago but yours, I cannot skip. So informative and straightforward. Love it! And I can’t believe how beautiful these PF new releases are! The packaging, especially. I feel like I could just leave them on my vanity tray on display. Most of them I’ve heard so much positive reviews on so I really can’t wait for them to come to my country soon (we are always one of the late ones, such a bummer 😅). Btw, your skin looks flawless even in such simple makeup. Thank you so much for the comment Anna – it means a lot to me! 🙂 My skin has FINALLY cleared up (at age 37) because I’ve been following Emme Diane’s acne coaching tips and using her products. It’s night and day for me! 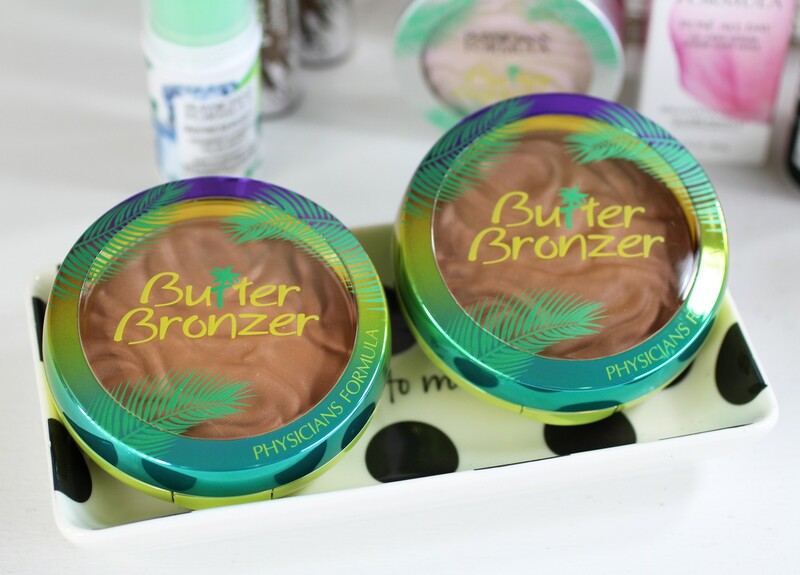 I’ve heard great things about the Butter Bronzer! Which color did you go with, or did you use all 4 of the shades shown? I didn’t really have trouble with it, but I may be a darker shade than you so maybe there’s more wiggle room.